Our dwarf Top Hat Blueberry is native to northern and alpine North America. ■ Loaded with small white blooms in spring followed by sweet full size 1/2" delicious, edible blueberries. ■ It has a harvest season of one month starting in early August. Self pollinating. Only 18" when fully grown. ■ The foliage turns a bright red color in the fall. 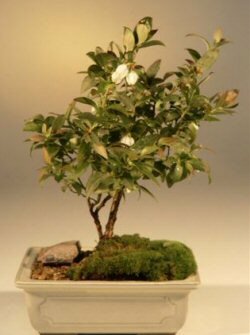 ■ It's small, glossy leaves, gnarly trunk and slow growth make this the best edible bonsai. Deciduous. Keep outdoors.